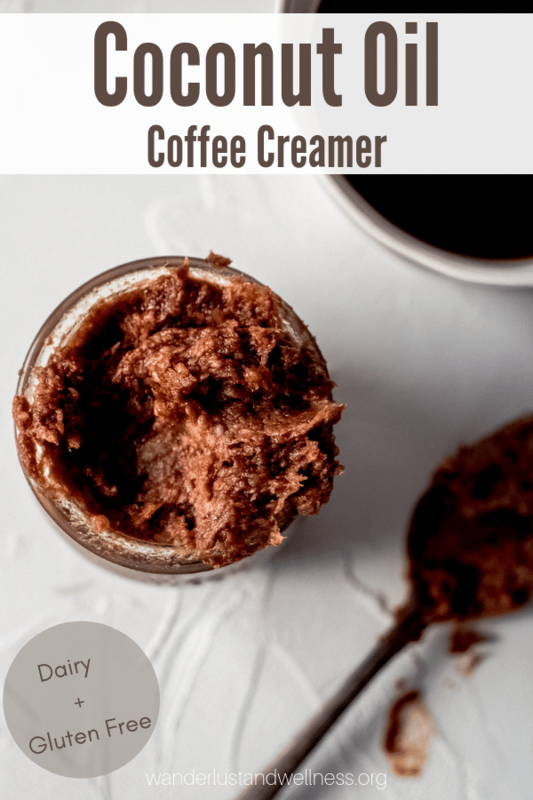 If you’re looking for a dairy-free and gluten-free coffee creamer that uses coconut oil, then this Mocha Coconut Oil Coffee Creamer is for you! 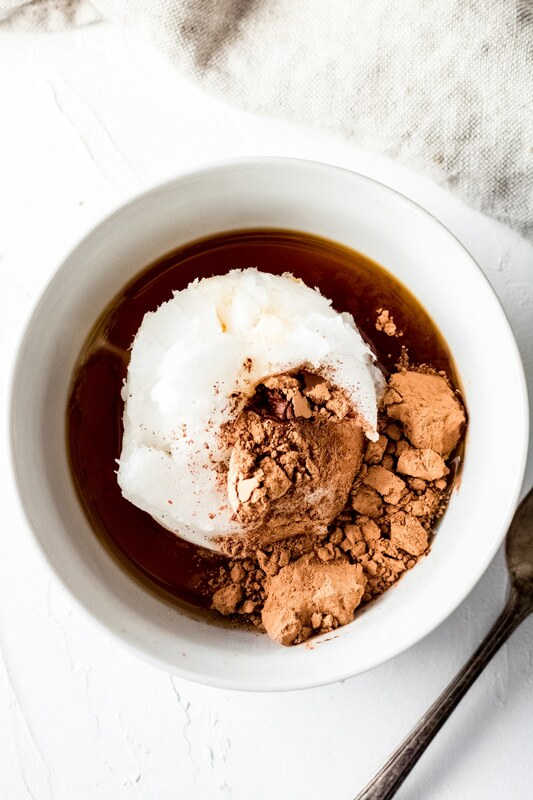 Many of our dairy-free coffee creamer recipes use coconut milk – but not this one! You’ll get the rich, velvety feel of blended coconut oil with this creamer. Made with just four simple ingredients – and easy to store – I think you’ll love this dairy-free option! It’s easy to blend, perfect for a homemade dairy-free “latte” and has a rich mocha flavor with just the right amount of sweetness. 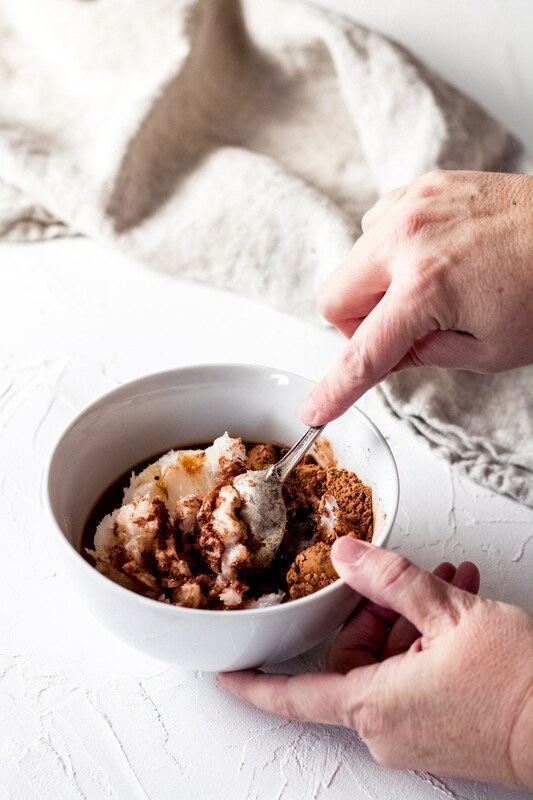 However – I do consume coconut oil in moderation and I do like using coconut oil in my coffee as a great dairy-free and gluten-free alternative for coffee creamer. When blended with my coffee – the coconut oil creates a velvety coffee drink that reminds me of my old latte days. Combine ingredients in a small mixing bowl. Using a spoon, stir to combine. Note – there may be small chunks of coconut oil but that is okay. Store in an air-tight jar at room temperature. Does coconut oil in coffee break a fast? Coconut oil itself will not break your fast – however, the addition of the maple syrup may increase insulin levels which may break your fast. I would suggest speaking to a health professional for exact fasting protocals. How do you prepare coffee with coconut oil? Great question! 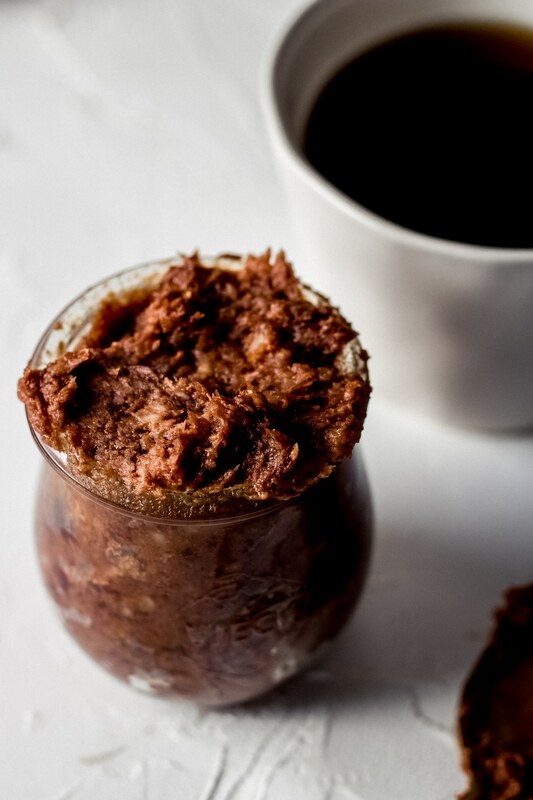 I suggest combining your coffee + the mocha coconut oil coffee creamer into a blender and blending for a few seconds. Or, if your cup is large enough, you can use a milk frother or immersion blender to blend inside your cup. Either way I suggest blending rather than just stirring. Does coconut oil make you poop? A very popular question indeed – and the answer is yes, coconut oil can act as a natural laxative and may stimulate muscle contractions on your bowels. There is a lot of conflicting information out there regarding the overall health pros and cons of coconut oil. I would suggest speaking to a dietary or nutrition professional for personal recommendations. I highly recommend Cara at Street Smart Nutriton. How much coconut oil should you have per day? 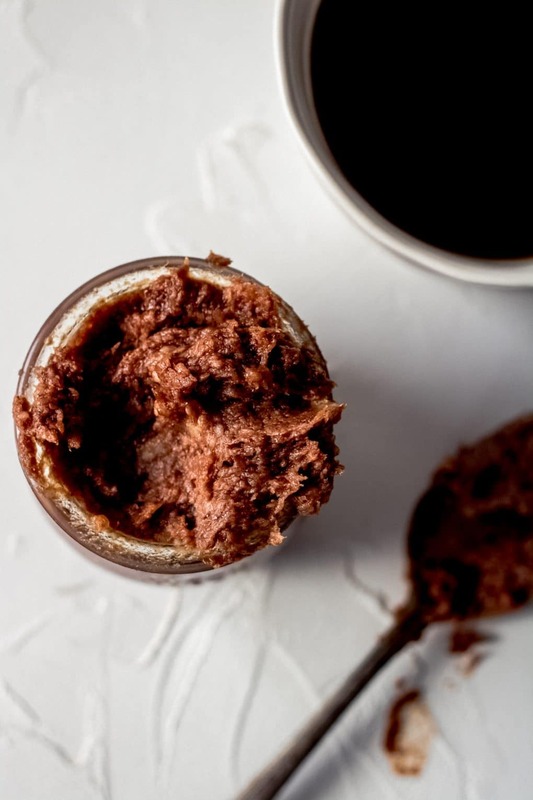 A creamy gluten-free and dairy-free mocha coconut oil coffee creamer – just four simple ingredients. 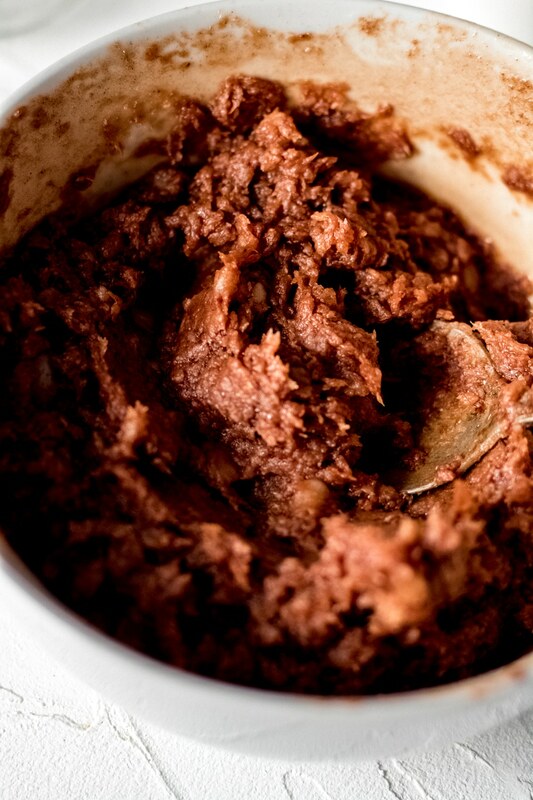 Add all ingredients to a small mixing bowl. Using a spoon, stir to combine. Note – there may be small chunks of coconut oil and that is okay. Transfer to an air-tight jar and store at room temperature. Add from 1 tsp. to 1-2 Tbsp. * to your coffee and blend to thoroughly combine. See notes in the FAQ section of the post regarding how much coconut oil creamer to use. 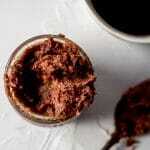 If you cannot find cacao powder, unsweetened cocoa powder will work as a substitute. Swap honey for maple syrup, or use stevia drops, if preferred. Nutrition information is an estimate and is provided for informational purposes only. If you have specific dietary needs or concerns – please consult with a dietary or nutrition professional.